WHO CAN STAND: Is there Too Much on your To-Do list?! 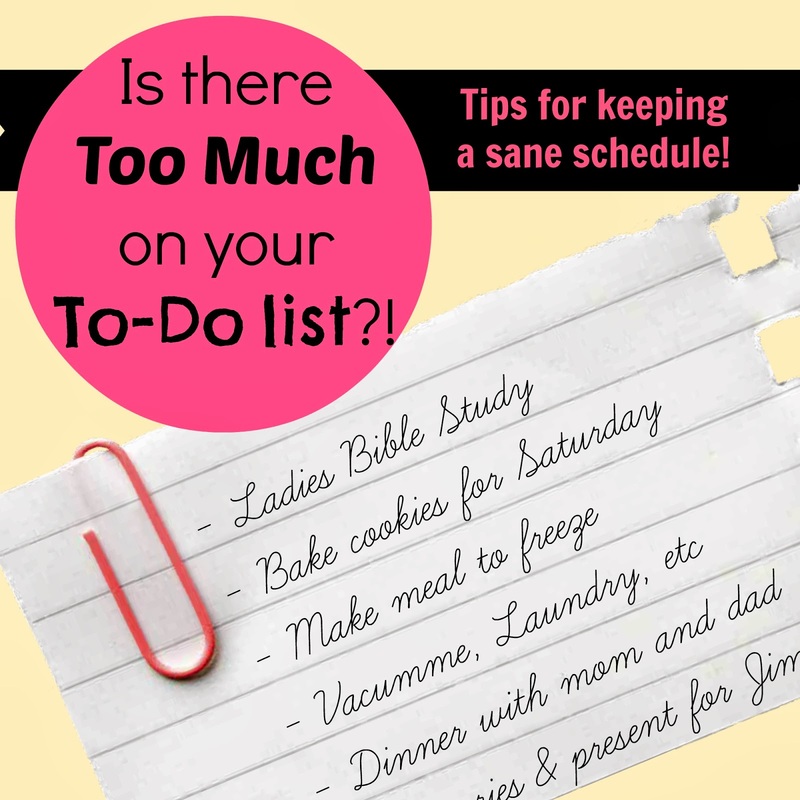 Is there Too Much on your To-Do list?! A good friend of mine recently told me she was often overwhelmed with too much to do, and wondered how I say no - and keep my agenda sane! I can't say I ever thought of myself as especially good at this, but as I thought about it throughout the day - I realized there are a few measures I take so that my priorities stay straight. Since I suspect we aren't the only two ladies who struggle with this - I thought I'd share my thoughts here as well. Feel free to chime in with your advice in the comments. I generally check with Andrew before I take on something new and ask him if he thinks it would be a good idea. He is much better than I am at knowing if I'm taking on too much. In addition, I want to make sure I'm doing things that he feels are good for our family (and he's happy for me to do many things simply because I enjoy them too!). I try and make myself weekly and/or daily to-do lists. Usually I make a week at a glance schedule (I just map it out on a notecard), so I know what events I have, and then also a list of things I want to get done that week. Then I slot those things into the gaps in the days where I am not out - trying to leave time on Thurs or Friday to just do the things I haven't finished from earlier in the week. Andrew and I will often go through our "to do" lists for the week or day in the morning or on Monday to see what the other wants to accomplish and to hear it ourselves too. We also share a Google Calendar, so we can put events on there and the other easily sees them - this is important for us because we are really good at forgetting! We have a "family vision" document which Andrew tries to have us go through once every few weeks which has the larger goals we want to accomplish, as well as bigger scale practical items. This helps me have a picture of what is important for me to be spending my time on and to prioritize. This is really great because if what you're doing looks different than what other mom's are focusing on, you have an understanding of why that is - it is about the vision of YOUR family - not anyone else's! As you can see, most of my success in managing my time and priorities well comes from consulting my husband. You are a team (Matt. 19:5)! And also, you are his helper (Genesis 2:18) - so don't be afraid to ask him how he'd like you to be spending your time! I think you'll be surprised how much this one little step can make a world of a difference.